Chrissie: A trunk full of gratitude. Ian: There's no gratitude in a policeman's trunk, Mom. On March 9, 1963, Los Angeles police officers Karl Hettinger and Ian Campbell pulled over a vehicle for faulty brake lights. Inside the car were two small-time criminals, Gregory Powell and Jimmy Smith. What was to only be a routine traffic stop turned into a nightmare for both Campbell and Hettinger. The officers were taken by surprise as Powell shoved a gun into Campbell's back, forcing Hettinger to surrender his weapon to Smith. The officers were forced into the assailants' car and ordered to drive to an onion field near Bakersfield, where Campbell was brutally shot and killed. As the film's trailer indicates, "What happened in the onion field is true, but the real crime is what happened after." The question as to whether or not this crime was a capital offense would result in over seven years of courtroom trials. All the while, Hettinger slowly slipped into a deep state of depression, manifested by feelings of guilt over his partner's death. 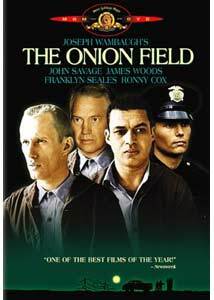 The Onion Field is based on the best selling novel of the same name by author Joseph Wambaugh. Wambaugh used this real life tragedy and his experience as a Los Angeles police officer to create a stunningly accurate account of the events leading to and following the incident in the onion field. Furthermore, Wambaugh took on the daunting task of adapting his novel into the film's screenplay, and he has done so with admirable results. The film wastes no time in introducing the four main characters but spends a great deal of time developing them; their credibility is exemplified through fantastic performances. Ted Danson, in his first major film role, gives a riveting performance as Officer Ian Campbell. Danson uses subtle vocal inflections and facial expressions as not only a way of expressing Campbell's anguish, but also as a foreshadowing of his upcoming fate. When the moment of Campbell's inevitable murder arrives, the audience cannot help but feel the jolt of this great loss. James Woods also gives a fantastic performance as Gregory Powell. It would have been so easy for Woods to overplay Powell's psychotic nature, but he instead uses a collective subtlety that makes him all the more frightening. John Savage creates a memorable portrait of Karl Hettinger, with a slow burn into a suicidal state that proves to be one of the more harrowing moments in the film. While anyone who is familiar with this true story already knows what to expect, The Onion Field is full of tension and suspense. Wambaugh and director Harold Becker have a unique method of keeping viewers on the edge of their seats, despite any knowledge of the film's outcome. A tense conversation on the drive to the onion field is just one of many masterful methods of invoking a sense of trepidation and incertitude. Like the best suspense films, the power of The Onion Field is the anticipation of what is going to happen next rather than what actually happens. For all of its attributes, The Onion Field is far from perfect. While the first half of the film is deftly executed, the second half diminishes into a banal courtroom drama. Furthermore, the film loses sight of character development and narrative flow. I get the sense that Wambaugh may have had trouble trimming his novel to an appropriate length at this point. Perhaps the most detrimental aspect of the film is the musical score. While creepy and atmospheric during the suspenseful moments, it is severely lacking in the more docile scenes. I fully acknowledge how difficult it is to create an effective film score; too noticeable a score will distract the audience, while too much musical restraint will not appropriately heighten the mood of the scene. Composer Emuir Deodato teetered on this fine line, and ultimately fell flat. Though The Onion Field left me somewhat disappointed, I do recommend the film. Excellent character development, solid acting, and a tense first half help to balance out many of the film's shortcomings. The kidnapping sequence and the events in the onion field are well worth a recommendation alone. I am not certain how well this film would have worked as fiction, but the fact that The Onion Field is based on a true story significantly adds to its intensity. Image Transfer Review: If it were not for the pinstriped suits and a slightly dingy quality, I would have never thought that this was a 23-year-old film. The negative appears to have been laboriously remastered, resulting in an image that rivals the best transfers of much more recent films. Color correction is remarkably accurate with the exception of occasionally orange fleshtones. The stunning black level realistically separates the background from the foreground, creating a wonderful three-dimensional effect. Even the darkest moments in the onion field exhibit excellent shadow detail. There are few video artifacts to complain about. Add a slightly grainy characteristic to the picture, and the result is an incredibly satisfying, film-like image. I would imagine that this transfer is even better than the original theatrical presentation. Audio Transfer Review: The original mono soundtrack is presented with respectable clarity. More so than any other 1970s monaural mix I have heard, the soundtrack is clean and free from distortion. The soundtrack is predominately dialogue-based, and the spoken words are always clear and intelligible. With surround decoding on, the audio properly remains locked in the center channel. While not terribly exciting, the monaural soundtrack excels in fidelity. Extras Review: I would not have been surprised if MGM had released The Onion Field bare bones with nary an extra in sight. After all, fans of the film would buy the DVD regardless of special features. Much to my delight, the cast and crew have taken the time and effort to provide viewers with several insightful supplements. First is the feature-length commentary by director Harold Becker. Becker's speaking voice is unusually raspy, as if he is straining to talk. While this made for an uncomfortable listening experience at first, I quickly found myself at ease with his naturally gruff style. I enjoyed hearing him reminisce about the production, but comments of real interest are too few and far between to necessitate a full-length track. Overall, it is a worthwhile listen, but not one that I could sit through for a sustained period of time. Harold Becker, Joseph Wambaugh, James Woods, John Savage, and Ted Danson all offer enthusiastic participation in the terrific documentary, Ring of Truth. I found this to be a step above most documentaries in terms of content. Wambaugh tells of how he was an LAPD officer when he wrote The Onion Field. James Woods describes his ethical responsibilities as an actor in portraying a real life character. Harold Becker admits that he never again had as much creative freedom on a film as he did on The Onion Field. These are just a few of the interesting facts that held my attention throughout this 28-minute documentary. Furthermore, all of the participants disclose candid information as to how they used the details of the crime and the history of the real life characters to create a more believable motion picture. Ring of Truth is a fascinating piece that has increased my appreciation for The Onion Field. The film's theatrical trailer is presented in anamorphic widescreen. The dated feel of the trailer is heightened by its poor visual quality. The narrative is quite effective, as we hear the incidents of this "true" story described, but the corresponding still images undermine the sense of tension. This is not a very good trailer, though it does serve as somewhat of an enjoyable time warp. The Onion Field is recommended entertainment for anyone interested in tense, dramatic stories. This real-life event has been admirably recreated through an intelligent screenplay, skilled direction, and tour-de-force performances. Featuring a dazzling image transfer and a light but fascinating section of special features, The Onion Field is another winning MGM release.